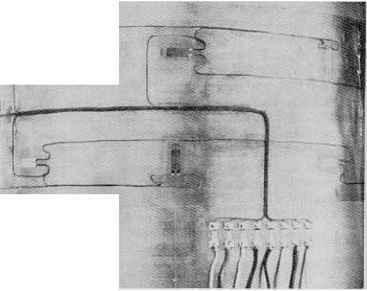 (f) capacitance gauges using changes in capacitance between two parallel or near-parallel plates. Each type of gauge has a particular field of application in which it can compete on equal, or even favourable, terms with the electrical resistance form of gauge. None, however, are as versatile and generally applicable as the resistance gauge. For further information on each type of gauge the reader is referred to the references listed at the end of this chapter. In recent years, photoelastic stress analysis has become a technique of outstanding importance to engineers. When polarised light is passed through a stressed transparent model, interference patterns or fringes are formed. These patterns provide immediate qualitative information about the general distribution of stress, positions of stress concentrations and of areas of low stress. On the basis of these results, designs may be modified to reduce or disperse concentrations of stress or to remove excess material from areas of low stress, thereby achieving reductions in weight and material costs. As photoelastic analysis may be carried out at the design stage, stress conditions are taken into account before production has commenced; component failures during production, necessitating expensive design modifications and retooling, may thus be avoided. Even when service failures do occur, photoelastic analysis provides an effective method of failure investigation and often produces valuable information leading to successful re-design, typical photoelastic fringe patterns are shown in Fig. 6.18. Ig 6.18. 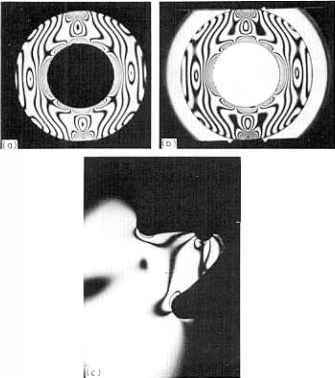 Typical photoelastic fringe patterns, (a) Hollow disc subjected to compression on a diameter (dark field background), (b) As (a) but with a light field background. <c) Stress concentrations as the roots of a gear tooth. 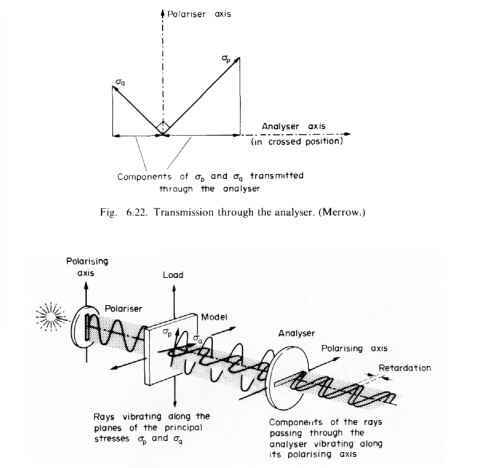 Conventional or transmission photoelasticity has for many years been a powerful tool in the hands of trained stress analysts. However, untrained personnel interested in the technique have often been dissuaded from attempting it by the large volume of advanced mathematical and optical theory contained in reference texts on the subject. Whilst this theory is, no doubt, essential for a complete understanding of the phenomena involved and of some of the more advanced techniques, it is important to accept that a wealth of valuable information can be obtained by those who are not fully conversant with all the complex detail. A major feature of the technique is that it allows one to effectively "look into" the component and pin-point flaws or weaknesses in design which are otherwise difficult or impossible to detect. Stress concentrations are immediately visible, stress values around the edge or boundary of the model are easily obtained and, with a little more effort, the separate principal stresses within the model can also be determined. Before proceeding with the details of the photoelastic technique it is necessary to introduce the meaning and significance of plane-polarised light and its use in the equipment termed polariscopes used for photoelastic stress analysis. If light from an ordinary light bulb is passed through a polarising sheet or polariser, the sheet will act like a series of vertical slots so that the emergent beam will consist of light vibrating in one plane only: the plane of the slots. The light is then said to be plane polarised. When directed onto an unstressed photoelastic model, the plane-polarised light passes through unaltered and may be completely extinguished by a second polarising sheet, termed an analyser, whose axis is perpendicular to that of the polariser: This is then the simplest form of polariscope arrangement which can be used for photoelastic stress analysis and it is termed a "crossed" set-up (see Fig. 6.19). Alternatively, a "parallel" set-up" may be used in which the axes of the polariser and analyser are parallel, as in Fig. 6.20. With the model unstressed, the plane-polarised light will then pass through both the model and analyser unaltered and maximum illumination will be achieved. When the model is stressed in the parallel set-up, the resulting fringe pattern will be seen against a light background or "field", whilst with the crossed arrangement there will be a completely black or "dark field". Photoelastic models are constructed from a special class of transparent materials which exhibit a property known as birefringence, i.e. they have the ability to split an incident plane-polarised ray into two component rays; they are double refracting. This property is only exhibited when the material is under stress, hence the qualified term "temporary birefringence", and the direction of the component rays always coincides with the directions of the principal stresses (Fig. 6.21). Further, the speeds of the rays are proportional to the magnitudes of the respective stresses in each direction, so that the rays emerging from the model are out of phase and hence produce interference patterns when combined. Fig. 6.21. 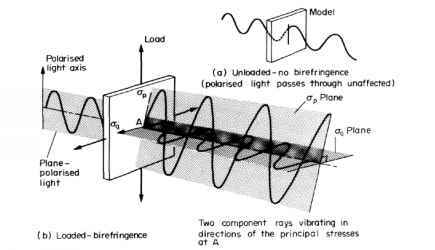 Temporary birefringence, (a) Plane-polarised light directed onto an unstressed model passes through unaltered, (b) When the model is stressed the incident plane-polarised light is split into two component rays. The directions of the rays coincide with the directions of the principal stresses, and the speeds of the rays are proportional to the magnitudes of the respective stresses in their directions. The emerging rays are out of phase. When a model of an engineering component constructed from a birefringent material is stressed, it has been shown above that the incident plane-polarised light will be split into two component rays, the directions of which at any point coincide with the directions of the principal stresses at the point. The rays pass through the model at speeds proportional to the principal stresses in their directions and emerge out of phase. When they reach the analyser, shown in the crossed position in Fig. 6.22, only their horizontal components are transmitted and these will combine to produce interference fringes as shown in Fig. 6.23.
it follows that the interference or fringe pattern produced by the photoelastic technique will give an immediate indication of the variation of shear stress throughout the model. Only at a free, unloaded boundary of a model, where one of the principal stresses is zero, will the fringe pattern yield a direct indication of the principal direct stress (in this case the tangential boundary stress). However, since the majority of engineering failures are caused by fatigue cracks commencing at the point of maximum tensile stress at the boundary, this is not a severe limitation. Further discussion of the interpretation of fringe patterns is referred to the following section. If the original light source is monochromatic, e.g. mercury green or sodium yellow, the fringe pattern will appear as a series of distinct black lines on a uniform green or yellow background. These black lines or fringes correspond to points where the two rays are exactly 180° out of phase and therefore cancel. If white light is used, however, each composite wavelength of the white light is cancelled in turn and a multicoloured pattern of fringes termed isochromatics is obtained. Monochromatic sources are preferred for accurate quantitative photoelastic measurements since a high number of fringes can be clearly discerned at, e.g., stress concentration positions. With a white light source the isochromatics become very pale at high stress regions and clear fringe boundaries are no longer obtained. White light sources are therefore normally reserved for general qualitative assessment of models, for isolation of zero fringe order positions (i.e. zero shear stress) which appear black on the multicoloured background, and for the investigation of stress directions using isoclinics. These are defined in detail in §6.19. (a) A complete indication of the variation of shear stress throughout the entire model. Since ductile materials will generally fail in shear rather than by direct stress, this is an important feature of the technique. At points where the fringes are most numerous and closely spaced, the stress is highest; at points where they are widely spaced or absent, the stress is low. With a white-light source such areas appear black, indicating zero shear stress, but it cannot be emphasised too strongly that this does not necessarily mean zero stress since if the values of crp and aq (however large) are equal, then (ap — nq) will be zero and a black area will be produced. Extreme care must therefore be taken in the interpretation of fringe patterns. Generally, however, fringe patterns may be compared with contour lines on a map, where close spacing relates to steep slopes and wide spacing to gentle inclines. Peaks and valleys are immediately evident, and actual heights are readily determined by counting the contours and converting to height by the known scale factor. In an exactly similar way, photoelastic fringes are counted from the known zero (black) positions and the resulting number or order of fringe at the point in question is converted to stress by a calibration constant known as the material fringe value. Details of the calibration procedure will be given later. (b) Individual values of the principal stresses at free unloaded boundaries, one of these always being zero. The particular relevance of this result to fatigue failures has been mentioned, and the use of photoelasticity to produce modifications to boundary profiles in order to reduce boundary stress concentrations and hence the likelihood of fatigue failures has been a major use of the technique. In addition to the immediate indication of high stress locations, the photoelastic model will show regions of low stress from which material can be conveniently removed without weakening the component to effect a reduction in weight and material cost. Surprisingly, perhaps, a reduction in material at or near a high stress concentration can also produce a significant reduction in maximum stress. Re-design can be carried out on a "file-it-and-see" basis, models being modified or re-shaped within minutes in order to achieve the required distribution of stress. where op and oq are the values of the maximum and minimum principal stresses at the point under consideration, n is the fringe number or fringe order at the point, / is the material fringe value or coefficient, and t is the model thickness. Thus with a knowledge of the material fringe value obtained by calibration as described below, the required value of (op — oq) at any point can be obtained readily by simply counting the fringes from zero to achieve the value n at the point in question and substitution in the above relatively simple expression. Maximum shear stress or boundary stress values are then easily obtained and the application of one of the so-called stress-separation procedures will yield the separate value of the principal stress at other points in the model with just a little more effort. These may be of particular interest in the design of components using brittle materials which are known to be relatively weak under the action of direct stresses.